May 20, 2013 - Hamilton School District. 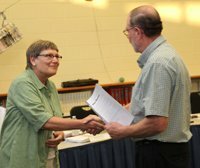 The 2012-13 retirements of six district employees were commemorated at the Hamilton School Board meeting. 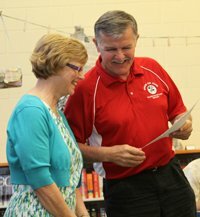 Combined, the employees provided 122 years of service to the district. 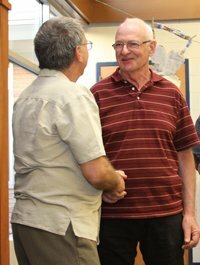 School Board members read and approved commendations for each employee that reflected comments from supervisors and colleagues, and each retiree was given a retirement gift. Those at the recognition were Marcy Elementary School Reading Specialist Sue Haertel, district maintenance staff member Terry Hanney, Hamilton High School art teacher Pamela Mierow, Woodside custodian Thomas Schneider and Hamilton health room paraprofessional Pam Trushinsky. Marcy special education paraprofessional Susan Schritz was unable to attend. The district’s Community Service Award was presented to members of the Hamilton Education Foundation’s Charger Challenge Committee. They included Jane Hessler, Kathy Holtzen, Roger Meidenbauer, Jacki Rottler, Judy Salus, Kelly Etzel, John Greiten and Steve Ristow. 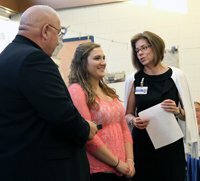 Hamilton senior Jessica Singer was recognized for her service to the School Board as the student representative during the 2012-13 school year. 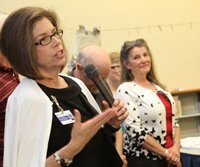 The School Board approved several documents including the Technology Plan Update, National Honor Society Handbook, District Professional Development Plan and revised employee handbooks for administrators, administrative assistants, confidential support staff, assistant cooks and associate kitchen staff, paraprofessionals and professional teaching staff. A new employee handbook was established for custodial and maintenance staff whose contracts expire June 13. All the district’s employee handbooks use a consistent structure. The full-time equivalency (FTE) of teaching staff will drop by a total of 3.38 next year due to shifting enrollment. Elementary will be down 4.05 FTEs, middle school will be up one FTE and the high school will decrease by one-third of a position. Paraprofessional staffing will decrease by 1.47 FTEs due to enrollment shifts. Decreases are 1.47 at the elementary school, .38 at the high school and .50 at the district level. The middle school will increase .88. Elective student fees increased including parking from $100 to $125, middle school athletics from $20 to $35, high school athletics from $30 to $45 and family athletic and activity pass from $60 to $75. Hamilton student fees are low in comparison to area school districts. In addition fitness center memberships will increase ranging from a $4.75 annual increase for an individual student membership to an additional $64 per year for a nonresident family membership. Lunch prices will increase five cents for student meals and a la cart milk purchases to new prices of $2.40 for elementary schools, $2.80 for middle and high school and 35 cents for milk. Increased the contract of Hamilton counselor and alcohol and other drug abuse coordinator Kristin Hasbrook from 40 to 75 percent.